Asus Transformer Prime was in news from many days and finally this honeycomb tablet has launched for those who really want to enjoy amazing functions of it. Today my intention is to provide an informative review of Asus Transformer Prime TF201-B1-GR Eee Pad 10.1-Inch 32GB Tablet (Amethyst Gray) but before moving ahead I want to inform you that you are free to buy this incredible Android Tab from Amazon. The price of Asus Transformer Prime is $499.99 which is quite reasonable when you will have a look at its high end specs and features. Now start exploring this android tablet. Are you getting bored from dual core powered Android tablet? If yes then do nothing just go for Asus Transformer Prime since it is the first tablet which is powered by NVIDIA® Tegra 3 Quad-core CPU. You may have an idea about dual core powered android phones and tablets but you surely don’t know what a quad core tablet can do for you. Therefore, I am here to tell you what you need to expect from its processor. When you will have this device in hand then you are able to browse the web pages more quickly than before. Sometimes, you feel that you are flying across the web pages. There is no lag in response time of its 1080p HD video output and snapper. The integration of triple core made this tab a speediest entertainment house for the users. Asus Transformer Prime is featured with a nice-looking 10.1 inch 10.1-inch WXGA Super IPS+ capacitive pressure-sensing multi touch display made with Corning® Gorilla® Glass. So it is quite certain that this screen lets you to visualize the world in a new and improved way. There is no picture blurring at any stage but you will feel that it offers more clarity than before. The brightness of display is boosted up so that you can conveniently read the content under the sun. 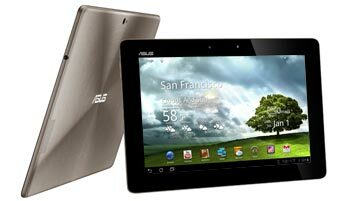 Crisp and clear sound is another plus point which pushes you to buy Asus Transformer Prime. Actually the sound quality of Built-in Stereo Speakers with SonicMaster Technology is amplified with the mean of SonicMaster technology and you know that this technology has grabbed the name and fame due to its accurate sound quality. 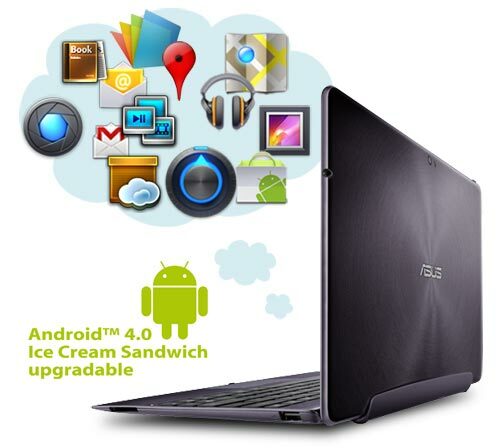 Asus Transformer Prime is featured with Android 3.2 Honeycomb operating system and good thing is that you can upgrade the operating system to Android 4.0 Ice Cream Sandwich as soon as Google makes it available for this tab. This operating system provides support to Adobe Flash so you can easily watch the flash sites and vides. On the top of this OS, you will find ASUS Waveshare UI that’s mean great customization and personalization is possible for you. There are more than 500,000 applications that you can download from the largest Android market. Asus Transformer Prime is featured with dual camera; one is 1.2 MP front facing snapper and second is 8MP rear camera. These dual camera will make it feasible for you to capture every moments of your life and then to share it online. Enjoyable video chatting is on hand through 1.2 MP front facing snapper. You can capture the every moment more clearly as rear camera is featured with flash, back-illuminated CMOS sensor, and large aperture design. You can connect the device with the internet through Wi-Fi 802.11b/g/n while data sharing is made possible with the mean of Bluetooth v2.1 + EDR. This tablet brings MicroSD Card Reader and Micro HDMI port. This Android tab lets you to explore the digital world with the mean of MyNet, MyCloud and MyLibrary. MyNet makes it feasible for you to stream online videos, music, movies and content. MyCloud helps you to access the digital content anywhere from the cloud. My Libraty is the most suitable option for those who wants to reads ebooks, magazines and newspaper. Asus Transformer prime is not only light but also slim as it has weight around 1.29 lbs and dimensions are 10.35″ x 7.12″ x 0.33″ (W x D x H). It would be quite comfortable for you to take the device with you anywhere you want. If you want to turn this tab into PC then you are free to use an optional Docking Station with Full QWERTY keyboard. This docking station will lets you to use this tab for up to 18 hours since it adds additional 6 hours of battery life. 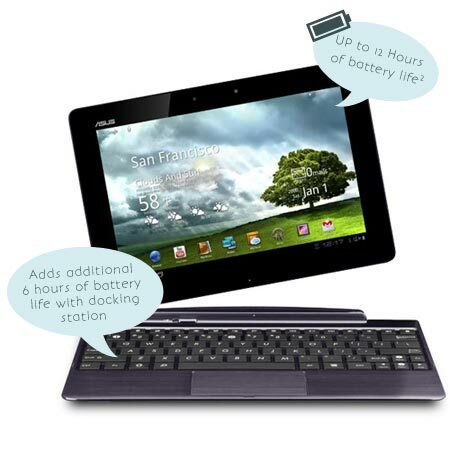 There are two models of Asus Transformer Prime: 32GB and 64GB.The price of Asus Eee Pad Transformer Prime 32GB model is $499.99 while you can buy 64GB model of Asus Transformer Prime for $599.99.